The house where I grew up sits near the edge of a woodsy ravine. I spent many a day exploring down there—catching water bugs, balance-beaming over the creek on a fallen tree, making forts… And while sadly, my boy doesn’t have everyday access to experiences like that, I know he gets more nature time than a lot of kids. Therein lies the whole point of Hike & Seek from the National Wildlife Federation. 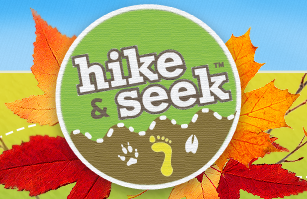 Hike & Seek is a 1-2 mile hike (1-mile unpaved trail for Minneapolis) with activity stations along the way to help kids explore everything that’s fun about nature. At the end of the trail, there’s even more fun at Basecamp, with a nature exhibit, live animals, crafts, photos with Ranger Rick®, snacks and more. Little hikers who complete the trail earn a Junior Naturalist badge too. Register on your own or as a team. Either way, you’ll be encouraged to do a little fundraising before the big day. And any funds you raise will support NWF’s programs to get kids outdoors and reconnect America’s youth with nature. Register here. And get all your questions answered here. The screens will be there when you get back. Promise. All children under 16 should be accompanied by adult.